Mount Agung (Gunung Agung) is an active volcano in East Bali. Towering 3,033 metres above sea level, Mount Agung is the highest mountain on the island of Bali and the fifth highest volcano in the whole of Indonesia. 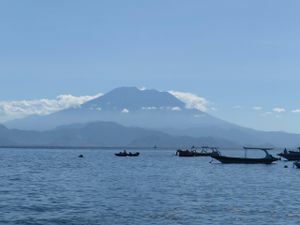 Mount Agung has huge spiritual significance to the people of the island, and is home to the 'Mother Temple' of Besakih. It forms part of a chain of volcanos that make up the back bone of Bali. Balinese legend has it that Agung was created when the Hindu God Pasupati split Mount Meru (the spiritual axis of the universe) and formed Mount Agung with a fragment. Mount Agung last erupted in 1963 (see information box in this article). This was one of the largest 20th century eruptions anywhere in the world. Historical eruptions of the volcano are poorly recorded, but there was certainly one in the 1820s. At lower elevations the mountain is covered in lush forest, but this soon gives way to a desolate landscape of barren volcanic rock and ash scree. From the peak of Mount Agung the views are extraordinary in all directions, but perhaps most dramatic to the east where the sun rises above Mount Rinjani on Lombok. Mount Agung last erupted in 1963, causing devastation in the eastern part of Bali and beyond. Ancient Balinese texts demand that the most important of Balinese Hindu rituals, the Eka Dasa Rudra, is performed every 100 years to purify our world. Such a ceremony was scheduled at Besakih temple in 1963. In February of that year Mount Agung started to rumble, and high priests argued that this was a bad omen from the Gods and that the wrong date had been scheduled for the ceremony. By this time though President Sukarno had arranged to attend with a group of foreign dignatories and he ordered that the event must go ahead. On March 8th the mountain was in a full pre-eruption phase and on March 18th it blew with such force that the top 100 metres or more was blasted away. Lava spewed over much of eastern Bali, a devastating gas cloud swept across villages and ash destroyed all crops. Up to 2,000 people are thought to have died and tens of thousands of homes were destroyed. Quite remarkably, the mother temple of Besakih perched high on the slopes of the mountain was relatively untouched by this event, fuelling the local spritual reasoning for the eruption. Further, many Balinese argued that this eruption was a portent of dreadful things to come and felt vindicated when the whole nation was plunged into civil crisis in 1965. The cleansing rituals from the 1963 ceremonies were finally finished at Besakih in 1979. Wild pigs and macaques abound on the forested slopes of Mount Agung. Birdlife is impressive including frequent sightings of hawks and eagles, but is not as obvious and easy to observe as in the West Bali National Park. A pair of monkeys are frequently seen at the crater rim above Pura Pasar. Mount Agung dominates the surrounding area influencing the climate. The clouds come from the west and Agung takes their water so that the west is lush and green and the east dry and barren. 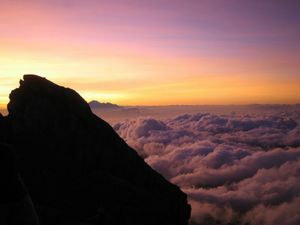 The best time to climb Mount Agung is in the dry season of April to October. January and February should certainly be avoided if possible due to heavy rain, possible flooding and even landslides in the area. At lower elevations it remains tropical but becomes distinctly cold and often very windy on the high bare rock slopes. The vast majority of groups climb Mount Agung on a guided day trip package, with a pickup late night from your accommodation anywhere in Bali and drop off after the climb back the next late afternoon. It takes 2-3 hours by car to reach either the Besakih (safe, more reputable guides) or Pura Pasar Agung (run by mafia, the way up to the brim here is medium safe/dangerous, and the way to the peak here is lethal, simply don't fall for their marketing but go via Besakih instead) trailheads and all logistics will be taken care of for you. You can also reach the same trailheads independently by rented motorbike/scooter with the aid of Google Maps and GPS navigation on winding country roads with almost no signage at all and low levels of English language skills of the locals. However you pass many villages with petrol stands and shops for basic items, interspersed among stretches of terraced rice paddies and low mountain passes with sweeping views as the mountain looms nearer and nearer on the horizon. The usual way to get to Besakih is from Klungkung. Besakih is about 20km north of the town centre. The road is not too bad, if a little winding at times. There is also a back road to Besakih south from Kintamani, and the hour-long drive is beautiful as you pass through forests, villages and fields. The road meets the main Besakih-Klungkung road just before the entrance to Besakih. If you are coming from the eastern end of the island, such as from Amed, Tirta Gangga or Candidasa, you can also get to Besakih by taking a smaller inland road from Karangasem. The road goes through small villages such as Selat and the Bukit Putung lookout, and meets the Besakih-Klungkung road at Rendang, where you turn north (right) to head up to Besakih. Bemos run to Besakih from Klungkung. They are most frequent in the morning. You may have to change bemos at Rendang halfway between Klungkung and Besakih. To get to the Pura Pasar Agung trailhead, the road towards the end is steep and windy and largely undeveloped, threading up through lush rainforest and terminating in a large mostly deserted parking lot with either no services at all or just a single street vendors selling snacks and water, depending on the season and time of day. Mount Agung is viewed as sacred and for that reason is off limits to climbers during important ceremonies, especially during the month of April. This is a long and serious mountain, not a light and easy hike that you can just rock up with boardshorts and flip flops as a day of your Kuta Beach Spring Break party holiday, involving some scrambling and rock climbing and exposure (sections where even a small miss-step would be deadly). As such almost everyone hires a guide, the rate of which presumably includes any fees and permits (see next section). With a guide, it will all be sorted for you with no surprises and included in your package price. Every travel agent in Bali advertises all inclusive day trips which cost between Rp 400,000 and Rp 1,000,000 depending on the route taken, the level of English you require, and your bargaining skills or lack thereof. They can also be booked abroad, but be aware "official" websites often advertise grossly inflated prices for an identical service booked locally. I was offered Rp 700,000 for private guide for myself only, on arrival at the trailhead. For those arriving without a guide by scooter/motorbike, at Pura Pasar Agung parking, there may be an Rp 3,000 parking fee. There is a metal gate just before the parking where some kind of fee or bribe may be demanded. At Besakih, the official car park fee is Rp 5,000 per vehicle. A sign in English at the trailhead claims unambiguously that guides are legally required and you will likely be immediately surrounded by the aggressive and intimidating men of the "local guiding mafia" who have quasi-authority of who gets in. If you are even considering not to have a guide, you need to read very carefully the below route descriptions and particular the section on safety to ensure you are comfortable with this decision, which all the locals will unanimously tell you is unwise, illegal and downright impossible. When in doubt, it's best to just go ahead and hire a guide. Even when hiring a guide, you need to read carefully the section on safety and skim over the route description to know what you're signing up for and what you need to wear and bring yourself to ensure a safe and pleasant trip. Your guiding company or tour operator will likely not advise you on this, to avoid the chance of you being turned off and not signing up and thus losing a sale. Many climbers are shocked by how difficult and long the climb is, and the technical and exposed nature of the short climbing section involved and not expecting the level of risk involved, aside from arriving with completely the wrong gear and inadequate physical levels. Some consider trying without a guide to be highly dangerous and disrespectful of the local community, arguing it is an important source of income you are denying them not to mention illegal. If there are any problems, be prepared to be judged harshly. It has also been said that a fatal accident would require huge ceremonies to "cleanse" the mountain and inconvenience the locals aside from negatively impact tourism. Arguments against hiring a guide include that the vast majority of the fees don't make it into the hands of the guides themselves but rather a corrupt bureaucracy and army of travel agents and intermediaries, that the system promotes guides of dubious quality, that the money could be better spent on trail maintenance, signage and rescue services. Experienced mountaineers argue they feel forced to hire a service that, for a similar mountain in the West, no one would even consider as necessary and the associated pressure from the mafia at trailheads such a requirement leads to is very unpleasant and completely contradictory to the spirit of nature and mountains. Avoid climbing in the wet season and especially in January and February. Whether guided or not, appropriate gear is essential. Footwear should absolutely consist of running shoes or hiking boots, with synthetic/technical running socks. If you have a lightweight technical Gore-Tex or similar jacket with hood (in case of rain, cold and wind) then I would recommend board shorts or running shorts (as lightweight as possible and not cotton) and a synthetic/technical running T-shirt as completely adequate. The trail in the forest is not overgrown, so longer trousers aren't necessary and will be too hot except possibly in early morning hours, and if taking long breaks. Trekking poles are highly recommended (to take pressure off your knees and help avoid a slip) and on similar mountains in developed countries, although they will need to be stowed away for the final section of the climb which requires scrambling with hands. European-style Compeed or American-style moleskin, for blisters, could almost also be considered essential in terms of safety and comfort if you are susceptible to this. Someone in the group (the guide for example) should be carrying a minimal first aid kit, working mobile phone with a local SIM card, GPS compass and map, and knowledge of how to call for a rescue, kept in a waterproof case, and ideally with a backup/spare battery. In the West, it would also be considered foolish not to carry a headlamp even if starting during the day, an emergency blanket, backup food & water and further first aid equipment such as compression tape. You should challenge any guide’s judgement if they do not have that equipment. Guides in Western countries would also carry a short rope and harness to aid unsteady-footed climbers on the short technical/exposed sections. Bad weather arrives often and without warning late morning or early afternoon which can lead to fog and it would be easy to get lost without basic mountaineering route finding skills, or have a slip and fall - potentially a deadly one. It has been reported that in May 2015, two climbers became lost having tried climbing without a guide. They were able to send an SMS to their friends who eventually alerted search and rescue, but they spent three days and two cold nights on the mountain until rescuers could locate them. Some mild altitude sickness is possible. Understand this condition and be aware of the symptons. It is important to drink more water than you think you need and to avoid the dehydrating effects of substances such as alcohol and caffeine for 24 hours before your planned ascent. At these elevations though, symptoms should only be minor. Plan your trip: Seek local knowledge, plan the route you will take and the amount of time you can reasonably expect it to take. Be aware of the weather: Mountain weather can be highly unpredictable. Check the forecast and expect weather changes. Know your limits: Challenge yourself within your physical limits and experience. 1. From Besakih (west) to the summit. This is a demanding climb starting close to Besakih temple. The ascent will take about 6 to 7 hours and ends at the very highest point of the mountain. The final hour or so is exceptionally demanding often requiring ascent on all fours. A sensible start time is about 11PM, so that you arrive at the top before dawn and wait for the sunrise. Allow as long to get down as it took you to get up. If you are fond of sleep and would rather skip sunrise at the summit and do the trek mostly during the day then you could start walking around 4AM. That should allow enough time to get up & down before night fall, with time for rests & meals. 2. Southern side: From Pura Pasar Agung Temple to the Crater Rim. The Agung climbing guides industry is unfortunately run by mafia types, who have a special monopoly on guides made from the Pura Pasar Agung temple, which gives them an incentive to market the Pura Pasar Agung as "the real way" etc.. Please note that this is a scam. Taking the trek all the way up to the absolute top from Pura Pasar Agung, is incredibly dangerous, as there are little pebbles and clay that could be slippery, in places where you need to do semi-climbing in steep angles. Dying from a misstep here is easy. These guides will be lazy, not supervise you well, and otherwise not inspire trust, but will instead behave childishly, and push you for money etc. . The safe way to Agung's absolute top, is from Besakih only. If you just want to get to the crater rim, the shorter ~2 hour walk from Pura Pasar Agung might be OK, but that trek does also come with some little danger. The climb starts at Pasar Agung Temple (1563m altitude), heading steeply and directly straight up a lush rainforest. The forest steadily thins and the trail becomes a "route" - finding the best way around small rock obstacles, slippery zones and what will either be running or dry stream beds depending on recent weather and the season. It gets progressively steeper and more exposed, with the technical difficulty culminating in a 20 meter long traverse of a ridge line, climbing a 3 meter rock step (French grade 4), a final, less steep section over dark, crumbly solidified lava and then ending dramatically at the moon-like crater rim and its 100 meter high cliffs of deep red and orange rock, spiraling into the abyss. From the highest point there are sweeping views of the entire island with the deep blue sea stretching 360° along the horizon. The total up and down is 8 kilometers however with nearly 1200 vertical meters to climb, you should have a reasonable level of fitness (knees and ankles are especially vulnerable on the descent). A guided group will usually take around 3-4 hours going up and half that again going back down and most guides try to time their clients to be at the crater rim for sunrise, arguing you have a better chance of avoiding rainclouds that often build in the early afternoon. It is logistically far easier for them, and arguably safer since it leaves the full day in case of emergencies to get off the mountain, but it does mean you will be starting the climb in the dark. For the sunrise, a sensible start time would be about 2:30 AM. If not then you could start at 6AM and trek in the daylight or indeed if the weather is fine (rare) and you are physically fit, even later. To find the trail, from the parking lot at Pura Pasar temple (1563m altitude), climb the series of stone stairs to the entrance gate of the inner temple. Traverse stone ledges and paths around the left side of the temple (with no signage) until it turns into a wide trail switchbacking once left, then back right and then straight up. There is also an older path, obvious and easy to follow but nearly completely overgrown with thorny underbrush leading up from around the right side of the temple, which intersects the main path after 1 km (at 1880m altitude) which is absolutely not recommended. Towards the top of the mountain, the route is well-marked with white dots until the rock step and one dot just after. Although it is somewhat obvious on the way down to find that location, you should note carefully in case of fog because the terrain is quite impressive and otherwise impassable. 2.1 Variation from Pura Pasar Agung Temple to the summit. There is apparently a junction point at roughly 2500m where an alternate route, marked with red and white dots, traverses out far left and eventually turns back to join the Besakih trail to the summit. However in April 2016, I couldn't find any trace of this route after much searching either on the way up nor down from the summit. Instead, it also possible - for experienced mountaineers only and only during stable weather - to link the top of the main route to the summit and back. From the top of the route at the crater rim, scramble left mostly directly on what quickly becomes in places a knife-edge ridge-line with constant and deadly exposure on the right as well as left sides and picking through sometimes very crumbly, unstable rock (French grade 3), until around 2900m altitude. At one point a rock wall around 5 meters high blocks the main ridge-line. It can be turned by down climbing and finding a notch to climb through (French grade 4) to get back again on the crater rim. You are then blocked by a very impressive gendarme which can be turned on the left along steep and exposed ledges but of mostly stable and good quality rock. Once on the left side of this, pick your way through very steep slabs with a few small cracks and chimmneys until you're back on the crater rim (French grade 3/4). A final, less steep slab section leads to the summit. Be mindful of being able to down-climb this. You need stable, dry weather and an ability to free solo grade 4+ where any slip would be deadly, or a rope and set of trad gear and ability to use it although protection would be difficult to place. There are no markings, no helpful hints of left gear or pitons, etc. and you need good route-finding abilities to avoid even harder French grade 5 pitches (and especially, to find your way back on the descent). From the summit an obvious and non-technical trail coming up from Besakih could be used as an alternate descent or to make for a traverse of the mountain although logistics would be complicated. 3. From Duku Bujangga Sakti (north). There is rumored to be a seldom used route, longer but less technical, starting from 300m altitude and usually involving an overnight camp at around 1700m and leading to the summit with a traverse rightward along the rim. However the terrain from the summit down that way looks quite technical and no further information could be found online - most sites seem to have cut and pasted the same block of text in their descriptions. 4. From Amed, Culik, Desa Datah, Kedampal (east). Though this route seems to be absolutely unknown it is still doable. While one can start at Amed this adds up to a 40km distance with 3km elevation altogether, which is possible but a long day. Open street map shows a path from Kepampal that doesn't seem to exist. There are however many little dirt tracks of farmers, dry riverbeds and deer crossings next to it and therefore at least two ways to walk up the ridge from Kepampal. When one reaches the sign in Kedampal that points left to "Embung Datah I" and "Embung Datah II" and to the right to "SDN 5 Datah SMPN Satap Datah" one has reached the fork of possible ways and also almost the end of the tarmac. The orientation is at times complex but it should work out fine on every fork with the first attempt. Just try to move upwards and westward whenever possible. After the very dense vegitation (between 800m and 2000m elevation) which requires one to find a path that is cleared by machetes (or lacks vegetation due to other reasons) there are huge patches of burned land, covered in ash. It is possible to walk in this terrain up to an angle of 60 degress. Close to the top there is a blue signpost that reads "Selamat Jalan by YSS". While no GPS is necessary it is surely helpful, especially when one doesn't mark the path on the way up. Mist and/ or clouds are a frequent problem during the day, but it is possible to orient by elevation, ridge, tracks and cardinal direction alone, so the visual range has to be very short to become a limitation. More serious problems might arise in heavy rain because some parts of the track will be very difficult to negotiate (trekking poles are highly recommended). Naturally you can't expect any other travellers and surely no mountain mafia, but also no help in case of emergencies in this difficult terrain. Aside from the mountain itself, Pura Pasar Agung is one of Bali's nine directional temples and it sits at the start point of one of the ascent routes up Mount Agung. It is close to the village of Selat on the main road from Rendang to Karangasem. The Sidemen/Selat area is stunningly beautiful. 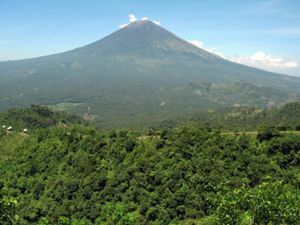 It incorporates several valleys in the foothills of Mount Agung on the route between Karangasem and Rendang. The drive through this area is most scenic and one of the very best in Bali. Stunning rice terraces, lush forested hill-sides and the mountain itself, all combine to make this a magical area to visit. If you stop in the village of Selat it is easy to find local guides for undemanding hikes in the area. Besakih is known as the Mother Temple of Bali. Besides being the most important temple for the whole of the island, another attraction of Besakih, actually a complex of temples, is its dramatic location on the southern slopes of Mount Agung. Part of the Besakih Temple complex. Like most major temples in Bali, the area surrounding Besakih is starting to take the shape of a small town, with many souvenir and eating shops. It can get overrun by quite aggressive touts and souvenir peddlers. As you leave the parking area, you will be stopped at a post and asked to make a donation and assigned a guide. This is on top of your official Rp 15,000 entry fee. The donation book will show many people donating huge amounts but please bear in mind that it is easy to scribble names and numbers with lots of zeros. The people collecting the donation can be quite pushy and will not think twice about asking for more money. You could try refusing to pay or suggest Rp 20,000 as your "first offer". While you may dislike guides, one may be quite useful as he will give a good explanation of Balinese Hinduism and the various temples of Besakih. He can also show you how to pray (it does not matter what religion you follow) if you so wish. Your "donation" covers the cost of a guide. The temple complex consists of at least 18 separate temples and numerous other shrines. Each temple has a specific purpose, whether it is for the worship of a particular god, for the use of the people of a particular region of Bali, or for the use of a particular caste. The only way to move around the temples of Besakih is on foot. 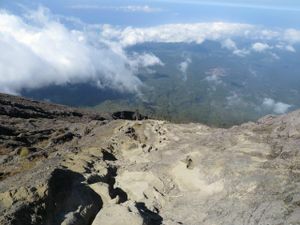 The complex gradually rises up the slopes of Gunung Agung and there are countless flights of steps. Be prepared with a pair of comfortable shoes. The most important and most impressive temple in the compex is Pura Penetaran Agung, which is built on six different stepped levels. The entrance, approached up a flight of steps, is an impressive split gateway (candi bentar) behind which is the kori agung, or gateway to the middle courtyard (jaba tengah). This is the area where during ceremonies hundreds of worshippers gather in pristine white dress, and create a quite wonderful spiritual sight. Non-Hindu visitors will never be allowed beyond this point into the inner courtyard (jeroan), and access will be restricted even here during special ceremonies. Indeed, many temple areas at Besakih may be off-limits when religious events are being held. There is though always something of interest to see. 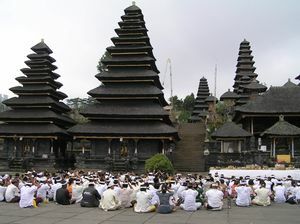 Other temples at Besakih include the remaining two equivalents of the three normal local village temples (see Bali Temples). Here though, these perform those functions for the whole of the Bali. The other two are called Pura Basukian and Pura Dalem. A visit to Besakih is a must-do for any traveler to Bali. It is though not always the easiest experience due to the very pushy souvenir vendors and guide touts. Those visitors who are not used to this type of attention should prepare themselves for a unique and sometimes very irritating trip. A fake ticket check is setup just before the actual one. The workers here will tell you that a guide is required to enter the complex and point to an official government notice that sets the price at 100,000 IDR. It is best to ignore them or openly shame them for this behavior. Apart from climbing Mount Agung, there are other far less arduous treks available in the area. Ask at your hotel for advice and arranging guides. As a rule of thumb, look to pay about Rp 70,000-100,000 per hour for a reputable guide. The area around the village of Selat provides a lot of options and local guides. There is a huge complex of souvenir stalls around the entrance to Besakih. There are few if any vendors at Pura Pasar Agung. Bring in ample good food with you for your trek. Sunrise on Mount Agung accompanied by a breakfast of fresh fruit and pastries is to be recommended. Once you start the trek there is nowhere to purchase food and you may not find food at the Pura Pasar Agung trailhead. Once you start the trek there is nowhere to buy water and no usable natural sources, so bring in enough with you. A flask of hot coffee or tea is also a good idea. Many do the climb as a day trip from the resorts like Kuta and Amed but there is accommodation more locally such as in Candidasa, Tirta Gangga or the Kintamani area. It is very hard to find accomodation closer to the mountain. There are no rules which prevent camping on Mount Agung and the northern ascent route requires it. If you do decide on a camping expedition it is still sensible to employ a guide and you must still check that there are no religious prohibitions of you being on the mountain at that time. It should also be remembered that Mount Agung can be very wet indeed. One option to stay in the surrounding area is located in Sidemen. Mount Agung is well connected by road to major tourist centres in Bali. The most obvious places to head to next are Candidasa, Amed and points west to Singaraja and Lovina. This page was last edited on 26 December 2018, at 14:59.